At A Plus Dental, we can restore the whiteness of your teeth during your first visit. Though teeth whitening is a non-invasive procedure, not everyone may qualify for the treatment. Thus, your dentist will first perform an examination to see if you’re a good candidate for bleaching. If you have dental work on your front teeth such as porcelain veneers, bonding, or crowns, as these don’t respond to the whitening solution. If your discoloured teeth are caused by intrinsic stains. This type of stain may need to be concealed rather than bleached. If you have worn tooth enamel or dentine hypersensitivity (sensitive teeth). If you have bruxism (teeth grinding condition) or suffer from temporomandibular joint disorder (TMD). Just like tooth wear and sensitive teeth, teeth whitening can aggravate these dental conditions. 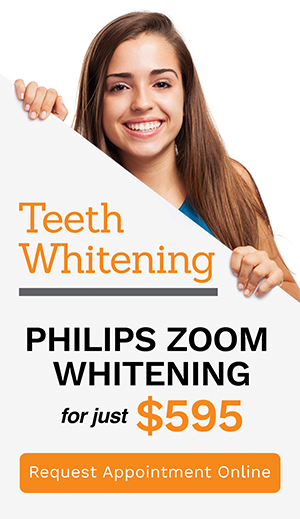 A Plus Dental offers Zoom WhiteSpeed. Zoom WhiteSpeed teeth whitening treatments are a quick and easy way to achieve a whiter, brighter smile. Our whitening treatment can be performed in as little as one hour. Zoom WhiteSpeed treatment is more convenient than at-home whitening kits. During the in-house Zoom WhiteSpeed treatment, the teeth are cleaned and examined. A plastic mouth guard is then placed over the gums to protect the soft tissue from the whitening agent. A light-activated whitening agent containing carbamide peroxide is applied to the teeth and when the Zoom WhiteSpeed is applied, the whitening agent bleaches the organic portion of each tooth. Results of our Zoom WhiteSpeed treatment are immediate. In contrast, at-home tooth whitening kits often require patients to wear a mouth guard filled with a bleaching agent for about 45minutes at a time over the course of 10 to 14 days. The Zoom WhiteSpeed procedure also offers a whitening agent in stronger concentrations than any over-the-counter at-home whitening product contains, resulting in brighter, whiter teeth. Compared to other tooth whitening options, A Plus Dental Zoom WhiteSpeed treatments are a quicker and more convenient way to whiten your teeth. Patients with persistent tooth discoloration or those who habitually smoke or drink coffee may require additional whitening treatments to keep their teeth looking their whitest. Good dental care and a healthy lifestyle are some of the best ways to help maintain the vitality and brightness of your smile. Keep your white smile for life with A Plus Dental’s Zoom WhiteSpeed treatments. 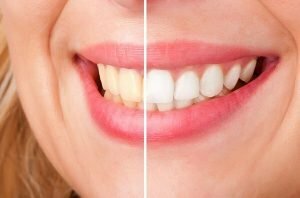 In-office teeth whitening is the safest and most effective method in whitening your teeth, and in only one appointment. Our teeth whitening treatments are safe for your teeth and gums and offer you a result that lasts. Call us at (02) 4627 3833 or simply book your appointment online TODAY!